Not really planning to do anything today, but I found this shirt in my moms closet and decided to, ahem, ‘borrow’ it. I love silk. Two marshmallows… I’m walkin’ on the wild side. I agree, so alexa chung, lovely! cute outfit!!! i would totally wear this! I lovee G-Dragon and Taeyang :) hahha (: cutee outfit. granny sheek! looove the outfit and i really wouldnt mind a cup of hot chocolate with marshmellows either!! I don't know why but the additional red socks is the cutest touch! I love the blouse as well! yeah without the socks it would have been too boring. And thank you! 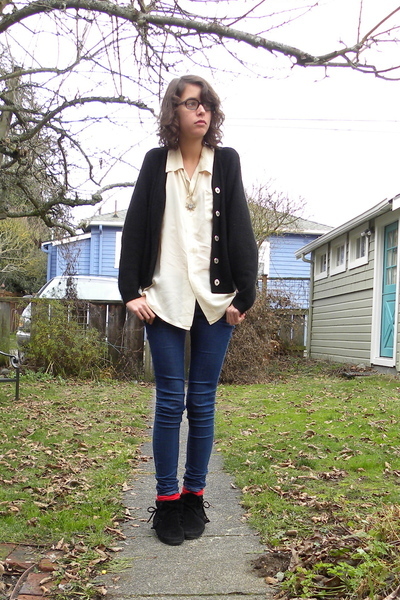 love the cardigan and shirt, great jeans and shoes too! very cool. love those shoes! oh i looove the shirt, cardigan and necklace!